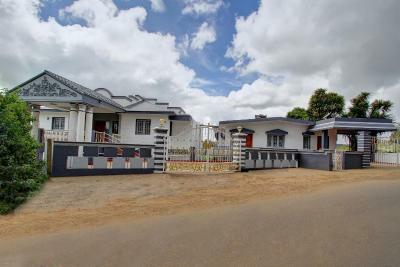 OYO 22924 Gv Residency is located in Ooty, within 1.4 miles of Ooty Lake and 1.6 miles of Ooty Bus Station. This 3-star hotel offers a 24-hour front desk. Hebron School Ooty is 2.6 miles from the hotel and Ooty Botanical Gardens is 2.6 miles away. The rooms at the hotel come with a seating area, a flat-screen TV with satellite channels and a private bathroom with free toiletries and a shower. All rooms feature a closet. Ooty Rose Garden is 3.1 miles from OYO 22924 Gv Residency, while Good Shepherd International School is 3.3 miles away. Coimbatore International Airport is 62 miles from the property. When would you like to stay at OYO 22924 Gv Residency? House Rules OYO 22924 Gv Residency takes special requests – add in the next step! OYO 22924 Gv Residency accepts these cards and reserves the right to temporarily hold an amount prior to arrival. We need at least 5 reviews before we can calculate a review score. If you book and review your stay, you can help OYO 22924 Gv Residency meet this goal.